Collaborative care for Ebstein anomaly | Norton Children's Louisville, Ky.
Audrey Sims’ first clue that her twins’ birth would be complicated came at 14 weeks of pregnancy, when a routine ultrasound found that one of her sons, Aiden, had a blocked lymph node, which can increase the risk of miscarriage. Audrey’s OB/GYN at King’s Daughters’ Hospital in Madison, Indiana, referred Audrey and her husband, Andrew, to Norton Children’s Maternal-Fetal Medicine for further testing. After an anatomy scan at 19 weeks and other tests, Audrey and Andrew learned that Aiden had Ebstein anomaly, a major abnormality of one of the heart valves, as well as a hole in the heart called a ventricular septal defect. Audrey’s maternal-fetal medicine physician then connected her with Brian J. Holland, M.D., pediatric cardiologist with UofL Physicians – Pediatric Cardiology. At 29 weeks, doctors detected an abnormal thickening of Aiden’s heart muscle — noncompaction cardiomyopathy. According to Dr. Holland, Aiden’s case was presented at the Norton Children’s Fetal Board, which meets monthly and discusses potentially complicated cases. The Fetal Board includes high-risk OB/GYN physicians, newborn general and cardiac surgeons, and neonatologists. Together, they made a plan for Aiden. When Audrey gave birth on Dec. 21, 2014, at Norton Hospital, the children’s hospital — just across a pedway — was prepared. “When she came in and delivered, we already had a team ready for what the heart conditions were,” Dr. Holland said. Aiden and his twin brother, Jaxon, underwent ultrasound tests soon after birth. “We can see a lot of details during pregnancy, but even more details about the structure after birth. Also, there are changes to the way the heart and circulation function after birth, so we were checking that as well,” Dr. Holland said. Dr. Holland also requested a cardiac catheterization for Aiden to measure blood flow inside his heart. The goal was to see if he needed surgery right away. Because Aiden had only one pumping chamber, Dr. Holland needed to see if the blood flow to the lungs was properly balanced. The cardiac catheterization showed that with the right treatments, Aiden could have a balanced circulation and did not need either the band or shunt surgery right away. Dr. Holland knew Aiden still had a way to go, with low oxygen levels in his blood and the risk of a weak heart with the cardiomyopathy. To prepare for the worst case, Dr. Holland consulted with heart failure and transplant members of his team at Norton Children’s Heart Institute, affiliated with the University of Louisville. “We have highly specialized team members available here,” Dr. Holland said. Fortunately, they were not needed. “In the end, we decided medicine and observation was all that was needed as a newborn,” Dr. Holland said. The twins spent their first six weeks in the neonatal intensive care unit (NICU) at Norton Children’s Hospital. Genetic tests showed that both twins had inherited a previously undiagnosed familial hypertrophic cardiomyopathy. According to Audrey, throughout the trying days and months she appreciated the optimism and confidence from the Norton Children’s Heart Institute team as they explained the surgeries that Aiden would need. At 10 months, Aiden underwent bidirectional Glenn shunt surgery, performed by Erle H. Austin III, M.D., pediatric cardiothoracic surgeon with UofL Physicians – Cardiovascular and Thoracic Surgery and then-chief of pediatric cardiac surgery at Norton Children’s Hospital. The operation connects the superior vena cava to the pulmonary arteries. This diverts oxygen-poor blood returning from the head and neck away from Aiden’s weakened heart and directly to the lungs where it can pick up oxygen. But, typically, blood returning from the rest of the body is still not getting all the oxygen it needs. 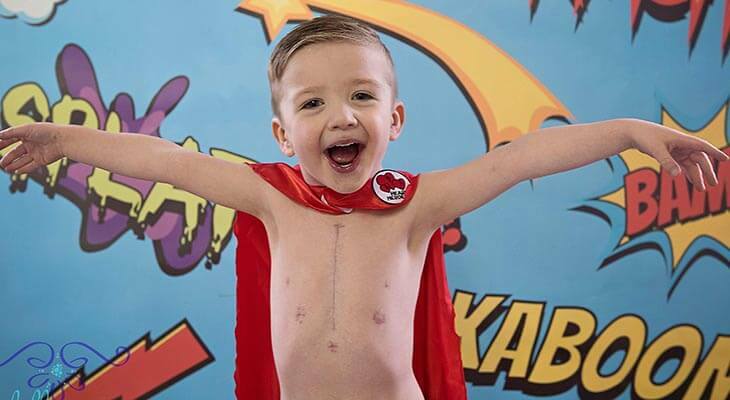 In October 2018, Aiden underwent Fontan surgery, which redirects oxygen-poor blood from the lower body into the pulmonary arteries. Dr. Austin said the team approach at Norton Children’s Heart Institute means physicians with different areas of expertise weigh in on the best approach in complicated cases. Quality pediatric heart care in Louisville. When the Sims family moved temporarily from Madison, Indiana, to San Diego, California, they felt such a strong connection to Dr. Holland that they flew back to Louisville every three months for follow-up appointments. “I think one of the really nice things that has allowed us to provide the best possible care for this family is we have had an ongoing relationship since pregnancy,” Dr. Holland said. Audrey said the family also became close with the NICU nurses, who come to the twins’ birthday parties. The twins are now 4 years old and inseparable. Jaxon is more rambunctious, and Aiden is funny and sweet, Audrey said. Meanwhile, Aiden has emerged from his surgeries and health challenges looking every bit like a typical 4-year-old. “Watching him play with his brother, you’d never know his heart had only one pumping chamber,” Dr. Holland said.